The ultimate program for people who love strength training! Great for building lean muscle, reducing body fat, increasing strength, endurance and coordination. You'll be doing a different workout video each day, with a daily guide that walks you through every step of the way. This program is roughly 90% lifting and is perfect for people who love their strength training. But this isn't just picking up heavy things and putting them down; this is functional strength, using many smart and varied styles of lifting and ranges of motion that are meant to improve not only the way you look but also your quality of life (which we would argue is much more important). While lifting is the main training type, HIIT also makes intermittent appearances - roughly one short bout, once a week - in order to round out the plan and to make it maximally smart and healthy for the body. These are intense workouts but there are are low impact modifications provided throughout the program and the strength training allows you to choose your own difficulty; it's all in how much you lift. If you prefer more of a 50/50 lifting/HIIT mix, we recommend trying FBBurn, FBSweat, FBFit or FB30. Workouts range between 31-42 minutes, averaging out to 37 minutes/day. This is a total body program. FB Strong is 5 days a week with an optional recovery workout in the 6th day, but the online workout calendar allows you to adjust the pace of the workout videos however you like. Just like with our other programs, you're not only getting a professionally built workout plan that uses a different workout video every day, you'll also have daily guidance throughout the program, on everything from mindset and body image, exercise form, modifying the workouts to work for you personally, and more. You'll also get to keep this program and repeat it as many times as you like, at whatever pace you like, at no extra charge whatsoever. This program includes a workout & clean eating guide to give you the essentials on how to properly nourish yourself during the program (please note, this is a general guide and not a meal plan). Program purchases are a large part of what allows us to be able to create our free workout videos and what help funds our website. We give our strength routines a 3/5 difficulty rating because it's neutral, but all of the workout videos that make up this program can easily be a 5/5 difficulty rating; it's all in how much weight you lift. Because of that, this program is suitable for a wide range of fitness levels and we highly encourage modifications and doing whatever it takes to make any given exercise work for you, your body, and your fitness level. Use #FBstrong on social media to track your workout sessions, share your progress, find motivation, and connect with people around the world who are following this program. 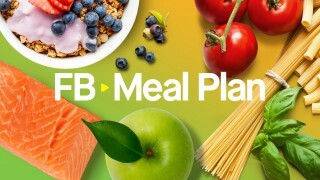 We encourage you to use our Community or #FBstrong and #fitnessblender on social media to track your workout sessions, share your progress, find motivation, and connect with people around the world who are following this program.